These funfetti white chocolate blondies NEED to be your next recipe for that special someones birthday! 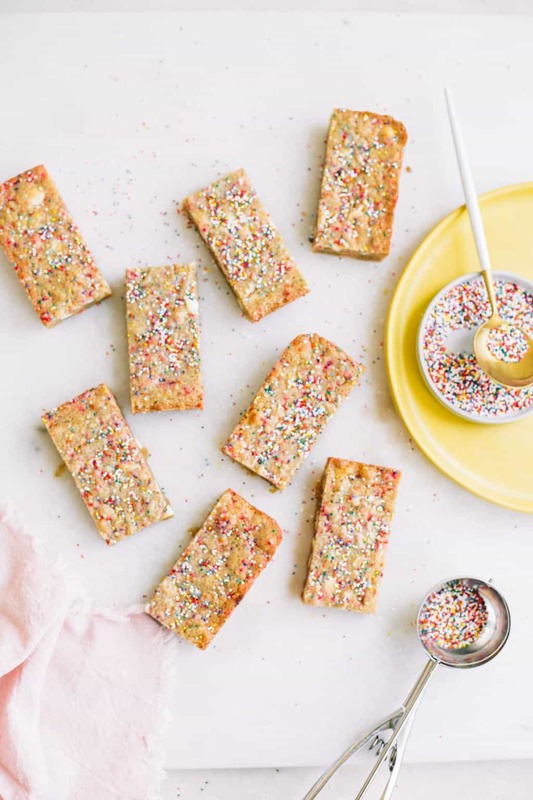 Not only are these chewy, gooey brown butter blondies perfect on their own we decided to amp them up with… SPRINKLES! Are you a routine person? If you are…I’m jealous and teach me your ways. The last few months I have had the hardest time getting myself into a routine. Mostly with work and business stuff but also with myself. I can never seem to get a good work flow going week to week. Some weeks I go to the gym five days a week and other days I maybe get 1 in. Some nights we eat takeout every night and other nights I cook every night! It’s kind of weird and it makes me feel so unproductive and blah. I have been trying to be as mindful as possible with this and really force myself to have ‘office/computer hours’ and ‘shoot hours/days’. Having a creative job is sort of weird. Sometimes you have a client pop in out of no where with a great budget and of course you want to jump at the opportunity. 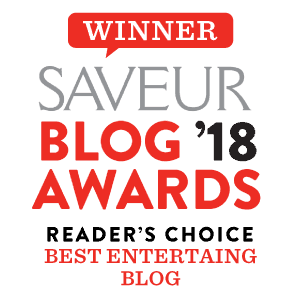 This also means that you have now gotten rid of your computer/office time which means your after dinner relaxation time has turned into blog writing or social media time. My brain hurts just thinking about it. All my other blogger ladies out there, can you relate?! Also, how the hell do you deal with it?! I have done my best to implement Monday and Tuesday as office days and Wednesday and Thursday’s as shoot days. Which leaves me to Friday’s. Fridays are my favorite day of the work week. I either allow myself to catch up on things I’m behind on or grab my assistant Abbie and we will work from a cute coffee shop for the day! I love doing this. Working from a coffee shop forces me to get out of my house (so I don’t procrastinate and do laundry or clean my prop closet) and it’s a fun change of pace that helps get our creative juices flowing. The last few times we have worked at a place called ‘Butter’. I snuck up to the counter a little passed 10 and ordered myself a chocolate chip cookie and Abbie a sprinkle cookie (she loves sprinkles!). Who doesn’t love a sneaky Friday treat?! It was a ‘bit’ too early for a marg or I would have done that! Abbie talked about that sprinkle cookie for a good week afterwards so I figured we needed to do something with this golden inspiration! 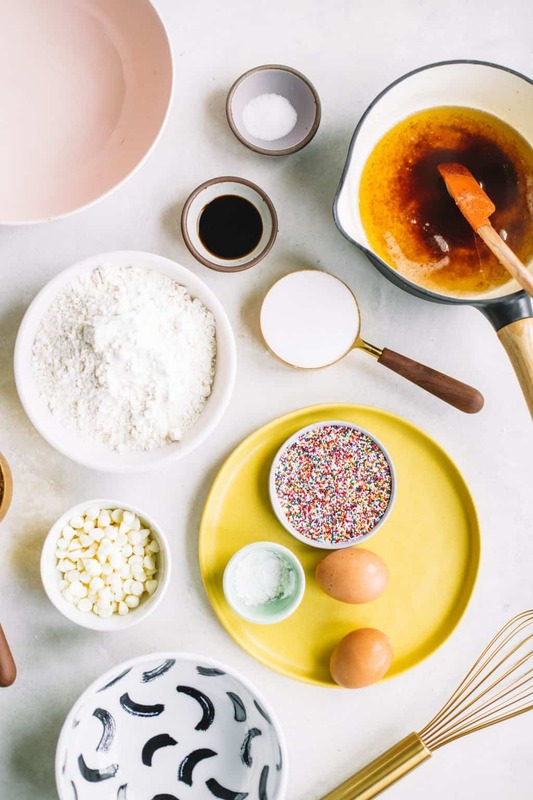 We got in the kitchen the week after and created these funfetti white chocolate blondies! They are just SO fun! Looking at these photos always makes me smile. Not only do the yellow plates make everything pop, the sprinkles are just a little ray of sunshine. I think they would make the most perfect Birthday treat if you didn’t want to make an entire birthday cake! 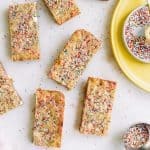 I couldn’t decide if I wanted these funfetti white chocolate blondies to be a blondie or a bar! Ultimately I went with a blondie because I love a gooey, chewy blondie. My secret to a golden blondie is using browned butter instead of regular! It adds a depth to the recipe and really makes these blondies come to life! 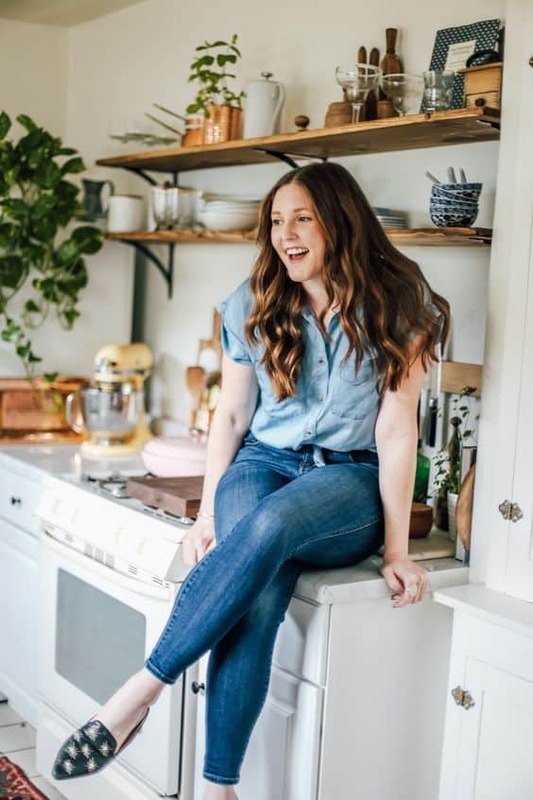 I am also always looking out for you sister, because I too, love a recipe that comes together in just one bowl with one spatula. No vigorous whisking, beating and minimal measuring. You can really use any type of sprinkles but I love these little guys the most. Don’t let the sprinkles fool you. 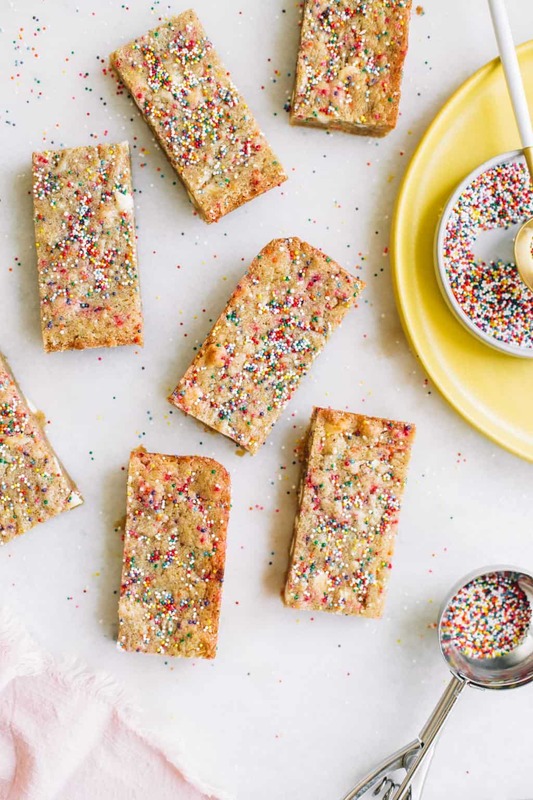 We just about devoured this entire pan of funfetti white chocolate blondies. Save this recipe for your next birthday or celebration when you need an extra special and fun dessert! Preheat oven to 350 degrees F. Line with parchment paper and grease a 9X9 inch pan. 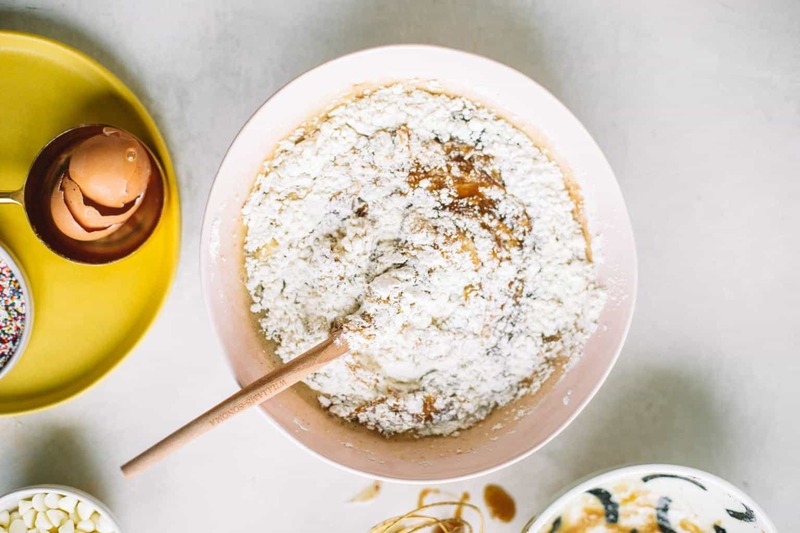 In a medium bowl whisk together all purpose flour, salt, baking powder and corn starch, set aside. 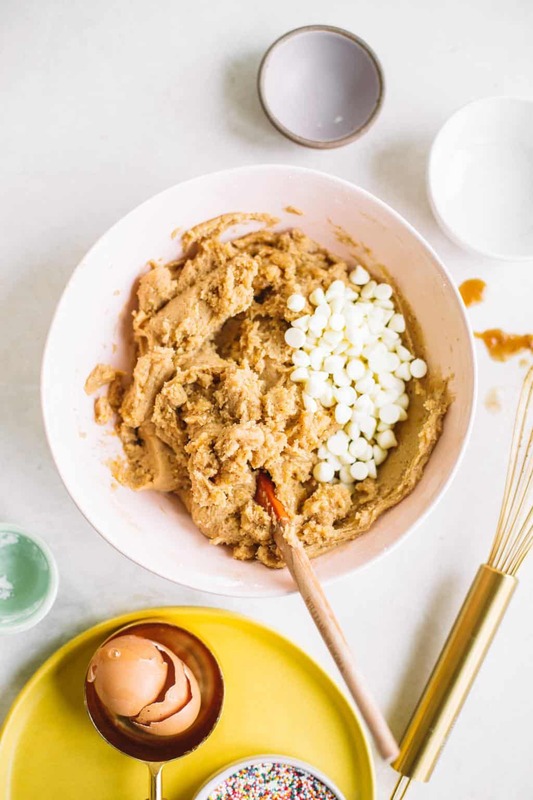 In another medium bowl whisk together browned butter, brown sugar and white sugar until smooth. Add in egg yolks and vanilla extract, whisk once more until smooth. With a rubber spatula gently fold in the flour mixture to the butter/sugar mixture in two increments until well incorporated. Stir in white chocolate chips, and 1/4 cup of sprinkles. Transfer batter into baking pan and into preheated oven. Bake blondies for 10 minutes. Remove from oven and sprinkle top with an even layer of remaining sprinkles. Continue to bake for 10-15 minutes or until a toothpick inserted comes out clean. Cool for 20-30 minutes before removing from the pan and cutting blondies. Browned Butter: In a heavy bottom sauce pan melt butter on medium heat. Melt/brown the butter until it just starts to turn a light amber color. Be careful! The butter can burn very easily! Remove the butter from the pan and into a separate large glass bowl to cool.